Home > ZR1 > 2009 Corvette ZR1 505 rwhp. 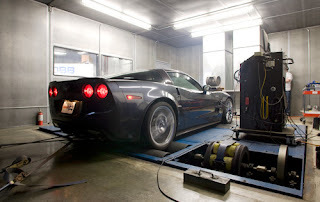 Edmunds Inside Line did a full test of the new Corvette ZR1 including dyno testing. After three dyno runs, power peaks of 505 hp at 6,200 rpm and 494 lb-ft of torque at 4,200-4,300 rpm were recorded. That's right, it makes over 500 hp at the wheels. I would have actually thought it would have been more to the tires. 0-60 in 3.8 seconds , and quarter mile in 11.5 seconds @ 128.3 mph. The car is fast no doubt. 1.06 G on the skidpad, and 74 mph though the slalom. One problem is that the 2009 Chevrolet Corvette ZR1 just doesn't feel special inside. Sure, the dash and doors are dressed up with leather, and they do look better than the standard Corvette's pieces. But the seats and steering wheel are the same pieces you'll find in a base Vette. And for nearly $120 grand that's not OK.
For what it's worth, our tester also leaked oil out of the gasket of its right cylinder bank and dripped it directly onto the exhaust manifold, periodically allowing the unmistakable stink of burning oil inside the cockpit. At highway velocities its steering wheel shook and shimmied like Shakira on speed. Then its left front tire pressure sensor failed.